"Patriotic is the theme. 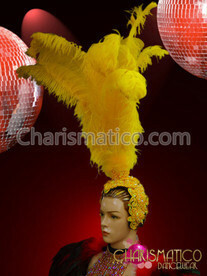 This Blue and Red ostrich feather headdress is the perfect complement to any independence day costume or themed show. It is what you need to complete it. Understated enough to be suitable for several countries depending on flag color. " 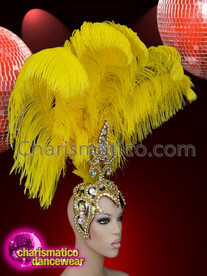 Swirl in some sunshine with this exotic iridescent seed bead embellished yellow ostrich headdress.